What’s your vision of a low carbon future? Most people now agree that the future economy will need to be a low carbon one. But what would a low carbon economy look like? And how should the West Midlands transform its economy to get there? If you have a view about these questions, we would like to hear from you. 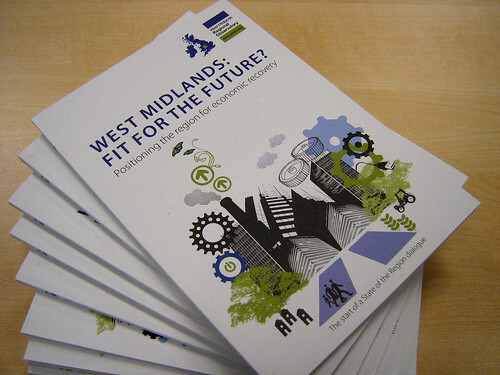 In 2009 the Observatory published a book called West Midlands: Fit for the Future? The aim of the book was to start a debate about the future of the West Midlands economy as it emerges from the recent recession. We’re now looking to build upon one of the themes that emerged from the original book: opportunities for the West Midlands in a low carbon future. In exploring the subject we’re inviting contributions from people with a variety of different perspectives on the issue. Whilst we’ve contacted some people directly, we’re also interested in receiving contributions from anyone who feels they have something interesting to say. Our aim is to stimulate debate, promote discussion and influence policy on the future growth of the low carbon agenda in the West Midlands.